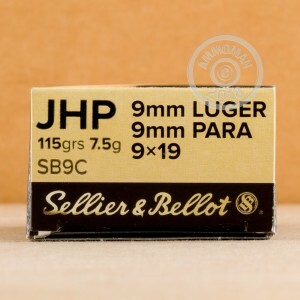 Feel confident that you have the ultimate protection with this 9mm Luger JHP ammo from Sellier & Bellot! 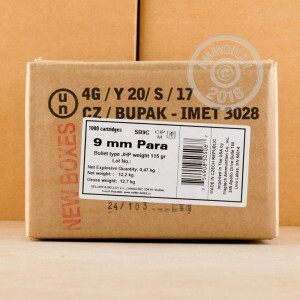 These 1000 rounds of 9mm ammo have a 115 grain jacketed hollow point bullet, sure to prove lethal to your target if you are caught in a bad situation. They have maximum controlled expansion when they enter soft tissue, where they will expand drastically to create a deadly wound. Each round is boxer primed and brass cased, as well as non-corrosive. The primer is sealed with a red lacquer for moisture protection, so rest assured this ammunition can be stored for years and still function flawlessly. 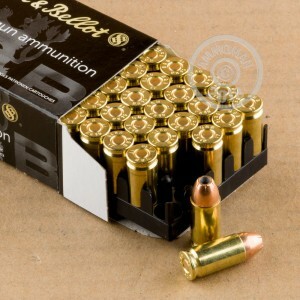 Sellier and Bellot is right up at the top of the list for manufacturing reliable, high quality ammunition without the hefty price tag. Order your 1000 rounds today and save per round when you buy in bulk, as well as receive free shipping! This is my target ammo and my carry ammo. Shipped very fast. Never had any problems with Seller and Bell or. best grouping ammo on the market, never jams, clean burning does not leave a filthy pistol to clean, cycles better than all ammo I have used, I have various 9mm, I use this ammo in all, so do my adult children.